Claude Monet loved to draw as a kid. When he was eleven, he entered a school for the arts and was soon using oil paints to capture the outdoors, something he would continue to do for the rest of his life. Born in 1840 in Paris, France, Monet is perhaps the most famous of the Impressionist* painters. He was known for his use of soft colors, light and shadows and would often paint the same scene over and over, simply to show how light changes during the day. He loved to paint reflections in water as well as the changing sky reflected on the water. An example of the water/soft colors/sky/reflections can be seen in his paintings of water lilies, which he painted from a pond he built in his garden at Giverny, France. 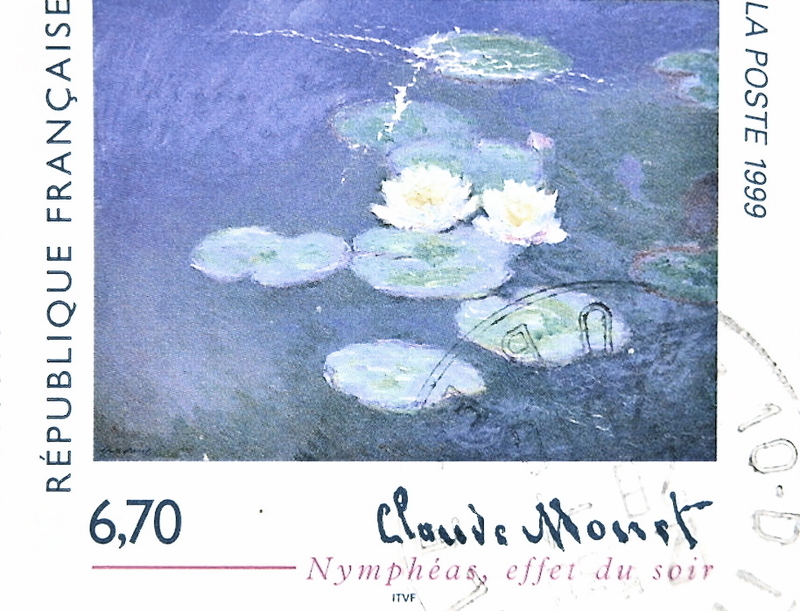 Monet did 250 paintings of water lilies, one of which is pictured above on a French postage stamp. A crazy tidbit: last year one of Monet’s water lilies paintings sold at auction for an astounding $54 million. Fifty-four million dollars. *Impressionism is a style of painting that began in Paris, France in the mid-1800s. The impressionists painted most of their paintings outdoors –– en plein air, which is a French expression meaning in the open air –– and often focused on natural subjects like trees, fields, and oceans.